Originally, lidar data was only delivered in ASCII format. With the massive size of lidar data collections, a binary format called LAS was soon adopted to manage and standardize the way in which lidar data was organized and disseminated. Now it is quite common to see lidar data represented in LAS. LAS is a more acceptable file format, because LAS files contain more information and, being binary, can be read by the importer more efficiently. LAS is an industry format created and maintained by the American Society for Photogrammetry and Remote Sensing (ASPRS). LAS is a published standard file format for the interchange of lidar data. It maintains specific information related to lidar data. It is a way for vendors and clients to interchange data and maintain all information specific to that data. Each LAS file contains metadata of the lidar survey in a header block followed by individual records for each laser pulse recorded. The header portion of each LAS file holds attribute information on the lidar survey itself: data extents, flight date, flight time, number of point records, number of points by return, any applied data offset, and any applied scale factor. The following lidar point attributes are maintained for each laser pulse of a LAS file: x,y,z location information, GPS time stamp, intensity, return number, number of returns, point classification values, scan angle, additional RGB values, scan direction, edge of flight line, user data, point source ID and waveform information. ArcGIS supports lidar data that is provided in either ASCII or LAS file format. The attribute information is maintained in ArcGIS for further analysis. ArcGIS Pro supports lidar in many ways, see Use lidar in ArcGIS Pro for more information. ArcGIS supports LAS versions 1.0, 1.1, 1.2, 1.3, and 1.4. The waveform information that is available when using LAS version 1.3 and above is not supported. Every lidar point can have a classification assigned to it that defines the type of object that has reflected the laser pulse. Lidar points can be classified into a number of categories including bare earth or ground, top of canopy, and water. The different classes are defined using numeric integer codes in the LAS files. Classification codes were defined by the American Society for Photogrammetry and Remote Sensing (ASPRS) for LAS formats 1.1, 1.2, 1.3, and 1.4. ArcGIS supports all versions of LAS. LAS version 1.4 is the latest LAS version and adds additional point classification and information which is outlined below. * The most current LAS 1.4 classification system has these codes (code 8: Model Key/Reserved and code 12: Overlap/Reserved) reserved, and points with these characteristics should use the corresponding class flags instead. LAS 1.1-1.3 only support classes 0-31. 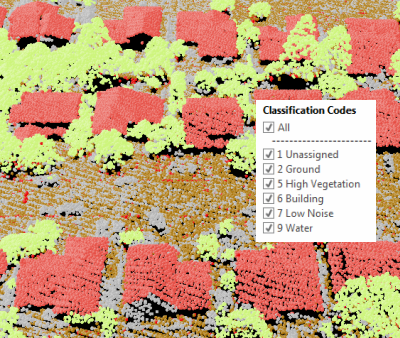 When a classification is carried out on lidar data, points may fall into more than one category of the classification. Classification flags are used to provide a secondary description or classification for lidar points. With LAS version 1.0, a lidar point could not simultaneously maintain two assigned classification attributes. For example, a lidar return from water may need to be removed from the final output dataset, but it still should remain and be managed in the LAS file as a collected lidar point. Using LAS version 1.0, this point could not be set as water and be withheld from analysis. In later versions (LAS 1.1 and later), class flags were used to solve this problem. Classification flags were added to the LAS standard to flag points with information additional to the traditional classification. Synthetic, key-point, withheld, and overlap flags can be set for each lidar point. These flags can be set along with the classification codes. For example, a water record could be given a classification code for water (9), as well as a withheld flag. The point will remain in the dataset but will be withheld from any additional analysis on the LAS files.